English adjectives and adverbs are essential for correctly describing the things you are talking about in English. This free online English grammar course will teach you the proper use of English adjectives and adverbs. It also contains interactive learning content and audio recordings by native speakers which will help you develop your English reading comprehension and listening skills. Continue your English learning journey, today. This English grammar course will first teach you adjectives ending in '-ing' and '-ed' such as 'amazing' and 'amazed'. You will learn how to use two or more adjectives together to describe a noun such as 'a big blue bicycle'. You will learn about Fact adjectives, Opinion adjectives, and how to use two or more Fact adjectives together. The course will also teach you other rules for combining adjectives in English. The course will then teach you how to use English adverbs correctly. You will learn that many adverbs are formed from adjective + -ly, such as fluently and beautifully. You will then be shown how to talk about how somebody does something and how something happens using the correct adverb. You will also study how to use adverbs before adjectives and other adverbs, and how to use an adverb before a past participle. By learning these rules, you will become one big step closer to becoming a fluent English speaker. 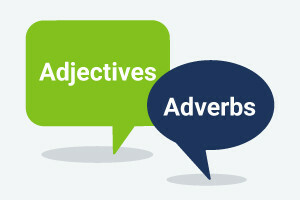 This intermediate level English grammar course contains valuable lessons on adjectives and adverbs that will really help you to express yourself better. This will not only help you enhance your English skills but will be a great boost for your career advancement around the world! So, make sure to check out the course and start learning essential English grammar rules on adjectives and adverbs, today. After completing this course you will be able to: Define the difference between describing a noun and how somebody feels about a noun. List adjectives ending in -ing and -ed and explain the different uses and functions of adjectives and adverbs. Describe how we can use two or more adjectives together. Justify how adverbs (quickly/likely etc.) tell us about a verb (how somebody does something or how something happens). Relate how adjectives of size and length (big/small etc.) usually go before adjectives of shape and width (square/round etc.) Review how we use adjectives after some verbs and how we use adverbs before adjectives and other adverbs. Demonstrate how you can use an adverb before a past participle (separated/flown etc. ).